Today I’m showing you two projects I made with Stampin’ Up “Ribbon of Courage” bundle. Had an awesome, enjoyable and uplifting time making these cards. The stamps in this bundle are very touching and heart warming. One card has the sentiment stamped directly on the card and the other has the sentiment stamped on a die cut label. The projects you can make with this bundle is endless. Card Measurements: 4.2" x 5.5"
Cut card base 8 1/2" x 5 1/2" , score @ 4 1/4"
Cut (2) Whisper White card 4" x 6"
Cut Wisteria Wonder cardstock 4" x 6"
Cut (2) Bermuda Bay cardstock 4" x 6"
Stamp images on whisper white card piece 11" x 4" to create custom designer series paper (dsp) for background. Create dsp in both colors. 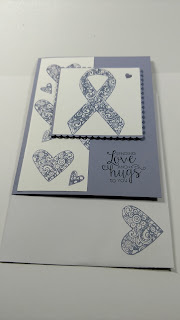 Stamp images on whisper white cardstock 4" x 6" piece and die cut using Bigshot. 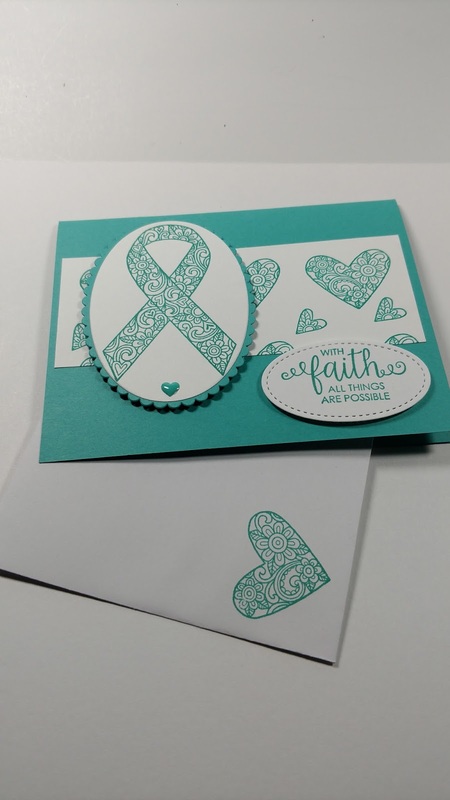 Stamp sentiment with bermuda bay ink pad using the Ribbon of Courage stamp set and then die cut with stitched shaped framelits. the wisteria wonder and the bermuda bay die cut shapes. Use fast fuse to attach designer series paper to card base. Layer die cut stamped shapes to card base with dimensionals. 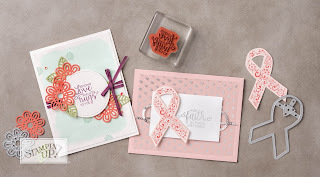 To give each your projects that extra pop add Wisteria Wonder and Bermuda Bay enamels shapes to card. If you know someone who needs this support and encouragement this would be a great bundle. Please join my team and together we can share our support and encouragement for ribbon awareness! Thank you for visiting my blog and please leave a comment.